The first interview was a short one with Kevin Roberts, of Saatchi & Saatchi. It was not very eleborate, but quite unique, because the answers were placed in Kevin’s original handwriting. 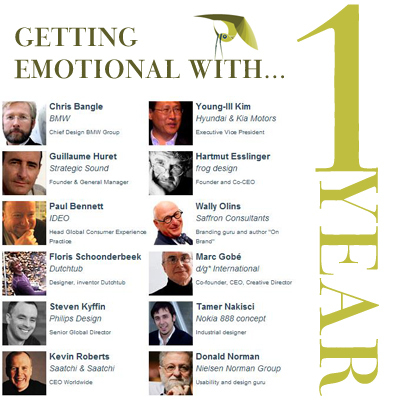 I am very proud to say that some of the most influential experts are featured in the series “Getting Emotional With…“, which has become quite a familiar title for many of you. Every day hundreds of interested visitors read one or more of the interviews. Because preparing the interviews and contacting the experts is such a time consuming business, the interviews have been limited to one per month. In the future I hope to publish an interview every 3 weeks or so. In the past year I have received so many emails of people that wanted to compliment me on the website, the interviews or just chat about “designing for emotion”. I am thankful for all of those kind messages. Many thanks! ARE you an expert and you see an interview in the “Getting Emotional With…” series as an opportunity to evangalize emotional design, please contact me as well. Of course, it is important that you or any other expert tries to implement some form of “design for emotion”. As this is clearly the theme of this website ;-).